In winter, Ibiza is fantastic: no tourists, no parties. 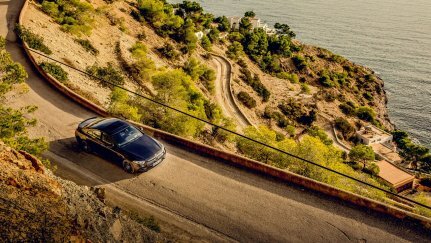 Only long, empty straights, challenging hairpin bends and the rush of the sea. The perfect terrain for an exciting automobile. In a fraction of a second, the Mercedes- AMG CLS 53 4MATIC+ transforms into a sports performer. 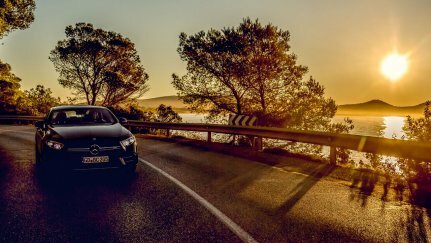 On the way to Santa Eulària, the EQ Boost pushes us back into our seats. We tap the gas and the Mercedes-AMG CLS 53 4MATIC+ rockets off. Wow! So that’s what happens when the power of gasoline and electricity are united toward the same end. Shame that we’ll soon be forced to brake at the next roundabout. There are tons of them on the route from Ibiza Town in the northeast of the island. But regardless, the powerhouse with EQ Boost knows how to win us over between traffic circles. 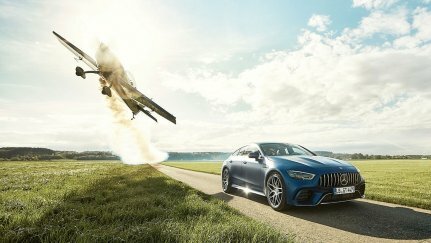 Thanks to its integrated starter generator (ISG), which provides an additional 22 hp and 250 Newton meters of torque when needed, the six-cylinder inline engine (435 hp) in the new Mercedes-AMG CLS 53 4MATIC+ accelerates from zero to 100 kilometers per hour in just 4.5 seconds. At the same time, the electrified 3.0-liter engine provides greater efficiency along with reduced fuel consumption and CO2 emissions. At the end of January, Ibiza’s roads are empty. The party season takes a break. You can feel it in Santa Eulària too. During the summer, the island’s guests and yacht owners throng the beachfront boulevard here. Now the Passeig Marítim is relatively deserted. Not a single yacht bobs in the tranquil bay. Most of the beach cafes are closed. We park right on the promenade — something else that’s only possible in winter. The sea is as smooth as glass. The palm trees are mirrored in our hood. 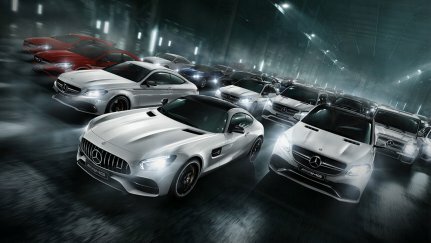 Of course, the Mercedes-AMG doesn’t remain undiscovered for long. Passersby stop, prowl around the car. Men, primarily. They marvel at the twin-blade radiator grille, which up to now has been reserved only for the V8 performance models, and the side skirts that accentuate the coupe’s muscular silhouette. Or the narrow, sharply contoured headlights that, like the eyes of a sharpshooter, focus intently on the target. Our next destination is Sant Carles de Peralta. In this small village is the legendary hippie bar Anita, one of the most popular spots on the island. Our cockpit’s widescreen display is already showing a temperature of 68 degrees Fahrenheit, yet Christmas decorations still hang on the church next door. At this time of year, with its soft light, more hushed tones and pleasant warmth, the Balearic island of Ibiza regains a little of its former innocence. In front of the bar sits Ito, an antique dealer, who is enjoying the morning sun. His store is within walking distance, but it’s closed now. “This is the best time of the year,” he says, sipping on his latte. “The entire island breathes a sigh of relief, and on the beaches it doesn’t reek of sunscreen everywhere.” Instead it’s fragrant with the scents of spring. The rosemary is in bloom, and gorse and lavender are about to follow. “You have to drive to Santa Agnès de Corona,” Ito advises us. “There’s an entire valley where the almond trees are in flower. It’s unique.” So is the drive there. A few miles further on, the road winds its way up the hills of the coastal cliff. We switch from Comfort to Sport+ mode and within a fraction of a second our once gentle glider transforms into a sports performer. The three-liter engine drops its pitch to a deep bass. The Mercedes-AMG CLS 53 4MATIC+ masterfully clings to the asphalt of the curves and pulls more inward than outward at the crest. Very confidence-building. Rarely has serpentine driving been so much fun. To the right of the coastal road, the view drops down to the turquoise waters of Cala de Sant Vicent. Three dogs race across the sand and snap at the waves. Two valiant swimmers emerge from the breakers. On the beach terrace of the restaurant Es Caló at the end of Cala, host Javier serves octopus from the grill. A solitary boat rocks at anchor in the glittering water while Javier’s subdued lounge music mingles with the sound of the surf. A perfect mix. On a longer straight that leads through a landscape of carob tree plantations and olive groves, we change to Eco Mode. The display indicates where we can attain particularly high fuel efficiency: Don’t operate the gas pedal too abruptly, accelerate sensibly, regenerate downhill. The energy obtained in this way powers numerous electronic features to which engine performance would otherwise have to be diverted. Along with regeneration, the hybrid functions also include load-point shifting and engine-off coasting. One more brief stop for tapas in Bar Costa in Santa Gertrudis, the liveliest island spot at this time of year. Many old-school hippies live here, crowding the cafes and restaurants in the tiny pedestrian area. After a bit of Iberian ham, olives and Manchego cheese, we head off once again towards the almond trees, the destination Ito recommended. We drive the last few miles in Sport+ driving mode again. To say it’s because of time is only an excuse. It’s also a matter of enjoyment. 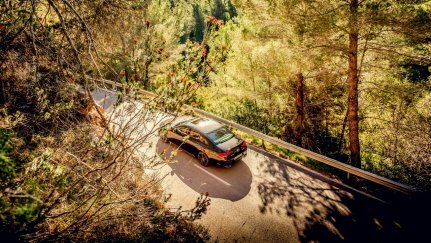 On suitably straightforward routes, we even let the Mercedes-AMG CLS 53 4MATIC+ drive by itself, our hands laid in our laps — a peculiar feeling. 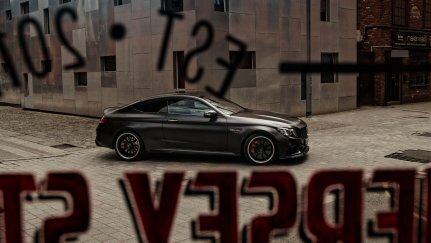 The Coupé steers stolidly at the specified speed; its cameras detect the lines on the asphalt and track the lane, and the steering assist asks us to take the wheel at regular intervals. The car autonomously takes notice of speed limits and throttles the engine. If you exceed one of the countless speed limits, it will chime discreetly. And if you leave your hands off the steering wheel for too long, the assist system politely reminds you via the display. When we finally come to rest in the valley near Santa Agnès de Corona, we’re overwhelmed. 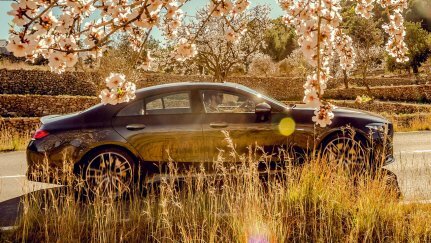 Hundreds of blooming almond trees transform the plain into a sea of flowers shining in soft pink. 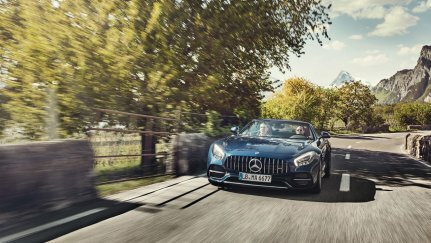 The Mercedes-AMG is parked a little way off and looks out of its sharply contoured headlights toward this vibrant plain. It makes no sound. Although the last sound it did make was barely perceptible anyway: power closing. Push on the door very lightly and it shuts by itself. Quietly, gently, without any EQ Boost. And yet very resolutely.